Goodreads: Sydney Bishop hasn’t returned to Haven Lake, her idyllic childhood home, since a pair of shocking, tragic deaths shattered her family when she was only sixteen. 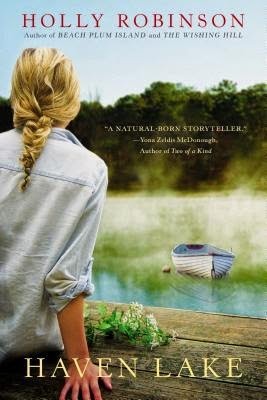 Now a child psychologist engaged to marry a successful surgeon, Sydney has worked hard to build a relationship with Dylan, her fiancé’s teenage son, so she feels nothing but empathy when he runs away—until she discovers that his hitchhiking journey has led him to Haven Lake and her mother Hannah’s sheep farm. Kritters Thoughts: Sydney is a woman who is on the cusp of getting married to a man who has a son and they are still grieving the loss of their wife and mother. Although everyone has been putting on a brace face and pushing their emotions under the rug - some events will break this family's secrets and feelings wide open and they will have to confront them. My main complaint about this book is the pacing. It just moved too slow for me and although I don't mind a "wordy" book, I didn't feel like all the words and all the pages were necessary - the characters didn't develop and I didn't get attached to them like I wish I had. I felt as though the characters repeated mistakes a few times and just weren't moving forward at a pace that I would have liked. At the same time that I didn't feel like the characters developed, I did find them likeable and was intrigued as to what the secrets were and wanted to find the answers to all the questions. Sydney was interesting and I was wondering who she would end up with and what would be her reasoning for her decision - a good love triangle does help a book out sometimes. I don't want to completely knock a book and I know there is an audience for this one. So if you like the wordy family dramas and love to curl up with a meatier book, then this one would be more up your alley than mine. Sounds like my life won't end if I miss it, but might be a good beach read. Pity the pacing was slow. The storyline certainly was interesting.